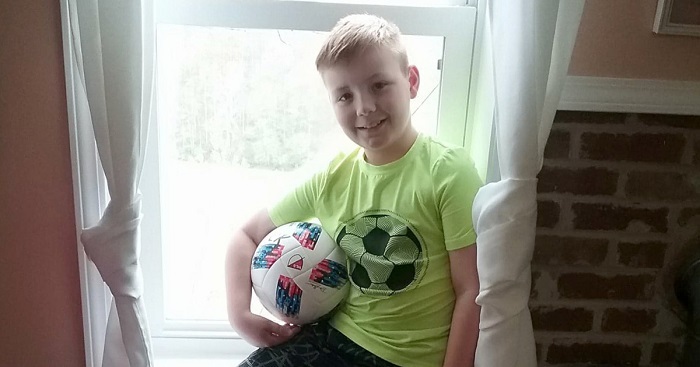 Last Thursday afternoon, 8-year-old Caleb Ray went to school, came home to do his homework, changed into his soccer uniform and headed to his first practice of the season. Just a few hours later, he collapsed and died on the field. Caleb’s mother, Kristy Ray, of Ranger, West Virginia, says that the autopsy will take six to eight weeks but they believe their son died from cardiac arrest. It was just after practice when Caleb — whose 4-year-old sister Maggie was also nearby playing soccer — ran back onto the field to kick the ball around. The ambulance came within minutes and 30 minutes later Caleb arrived at the hospital. His parents held his hand as the doctors continued to give him chest compressions, but it was too late, says Kristy. In the six days since her son’s sudden death, Kristy and her husband Ryan Ray, 35, are trying to come to terms with the fact that Caleb isn’t coming back. And while they’ve had to buy a casket and write an obituary for their son — two moments that she doesn’t know how they managed to get through — Kristy and her family find happiness in remembering how special Caleb was. When Caleb saw a classmate who had a hole in their shoe or didn’t have any lunch, he would come home and ask Kristy if she could pack an extra lunch or give money to the family. And once — at a fundraiser for his mom’s friend who needed a kidney transplant — he asked if he could donate one of his. After Caleb’s death — which has “showed us how much of an impact he really did make” — Kristy says a YouCaring page was created for the family. But because they had a life insurance policy for Caleb — something they hoped they’d never have to use — the family wants to use the money that they’ve raised in other ways. Kristy hopes to spend her time creating a nonprofit that will spread awareness about heart issues in children, and use the funds to buy defibrillators for as many schools as possible.